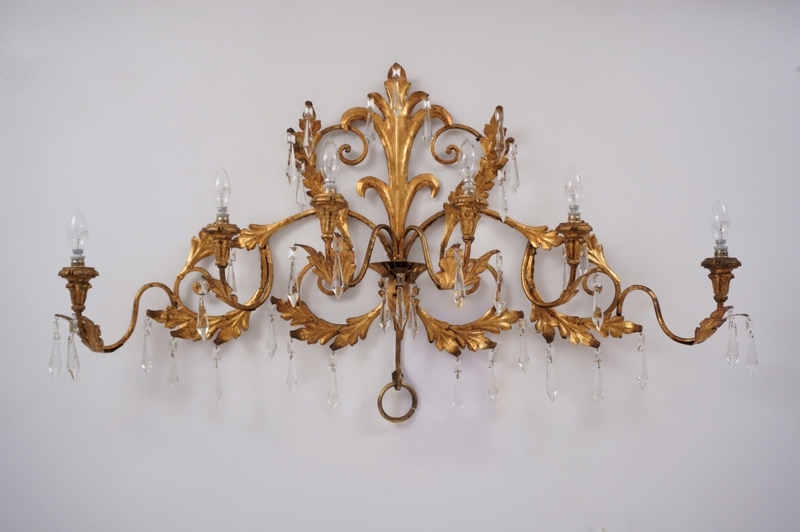 Gilt tole sconce,large 6 lights, with faceted crystals, 1950`s ca, Italy. 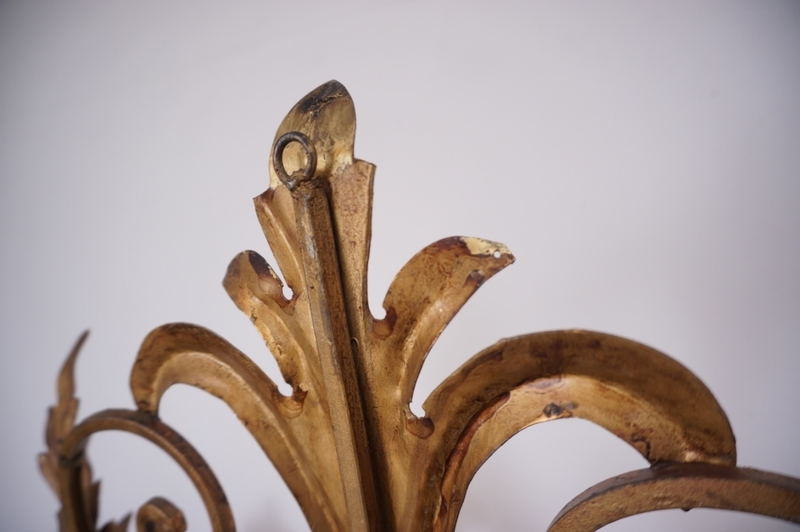 This large sconce has been thoroughly cleaned respecting the antique patina. Newly rewired & earthed with gold silk cable and new fitted brass & porcelain lamp holders. It is in full working order, PAT tested & ready to install. Light bulbs included. It is possible to install this light in other countries although it may be necessary to purchase different light bulbs suitable to local electricity. It can be used with a dimmer. 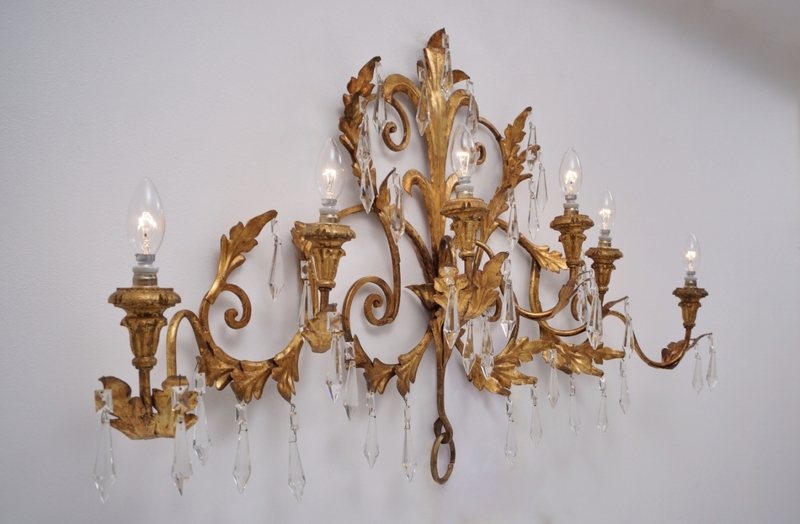 Very large Italian quality gilt iron tole sconce in leaf & vine form. 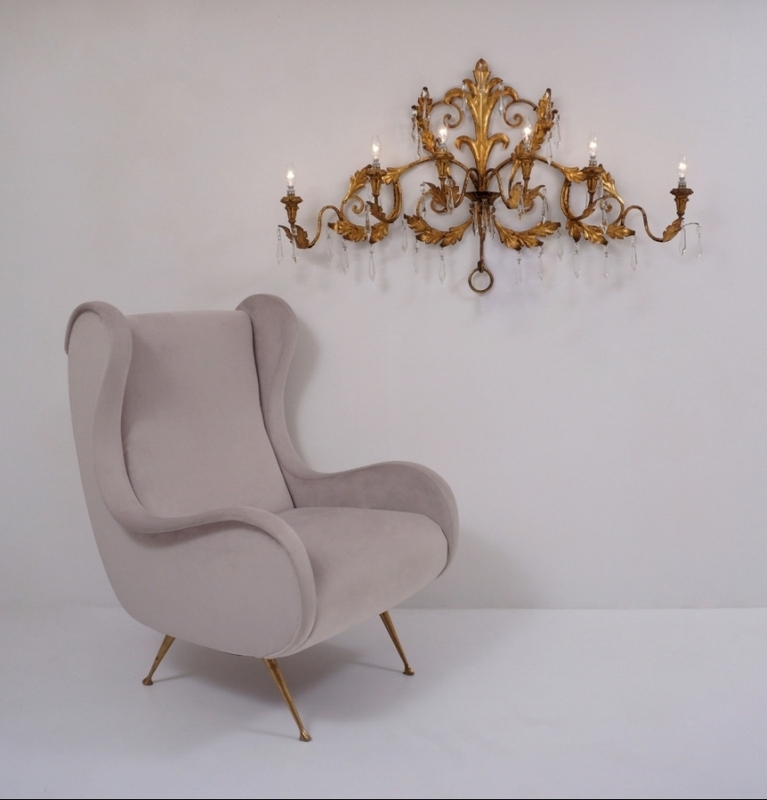 Spanning over a 120 cm, this very large decorative sconce makes an ideal feature piece for a traditional or contemporary interior, perhaps over a sofa, fireplace, bed or any wall. The quality frame consist of 5 branches in gilt metal of square section to add strength and hide the wiring. 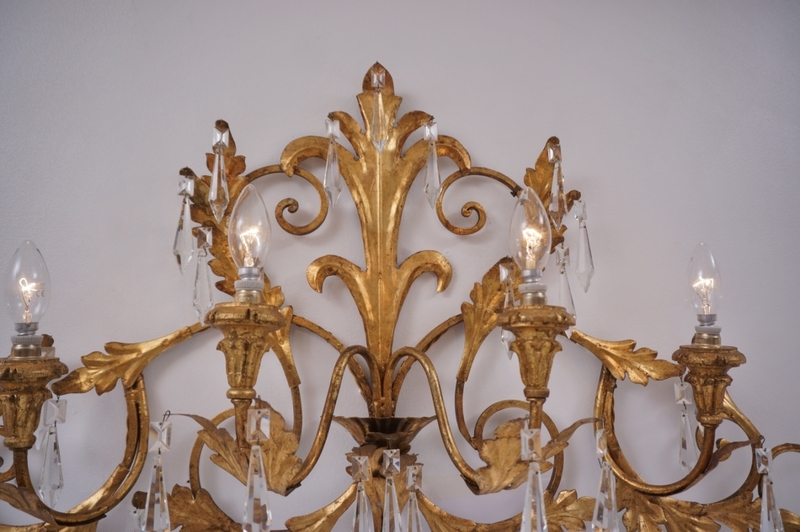 These branches depart from a central gilt metal canopy, which also works as a compartment for the hidden electric cables. This allows a discrete connection to the wall. Alternatively it could also work with a cable plug into a wall socket. 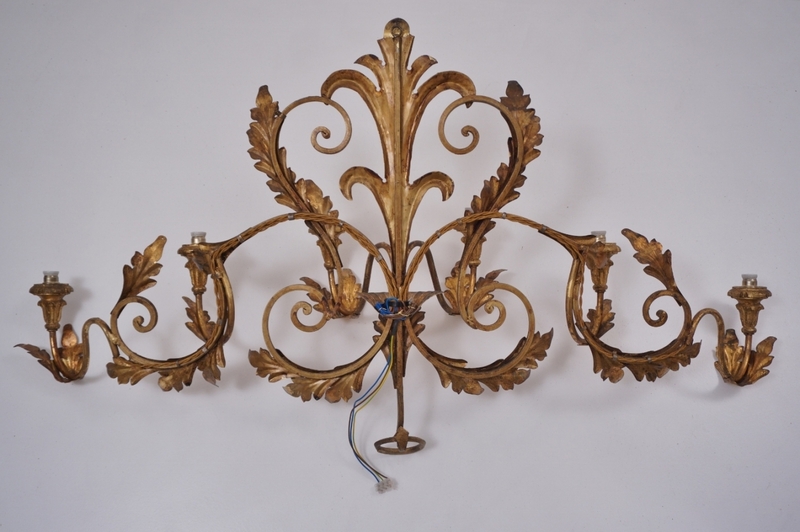 The main vertical branch finishes at the top with a gilt metal ring to hook the piece safely to the wall. The front side is decorated with folliage in a Fleur de lis motif, creating a focal point, and faceted crystals pendants to add reflections and depth. The bottom portion of this vertical frame finishes in a decorative ring. The two main long branches spreading sideways have a combination of swirls & decorative folliage with crystals. The upper portion of these long arms spreads sideways, and each side has 2 lamp holders with decorative gilt wood bobeches. The bottom portion of these two arms, also decorated with folliage & crystals raises upwards towards the main top decorative centre motif. From the central canopy there are two shorter arms, of tubular section, each finishing in a lamp holder. In total there are 6 lamp holders. Each takes one standard E 14 small screw light bulbs up to 40 Watts. Presently fitted & photographed with Candle clear light bulbs of 25 Watts, which are included in the price. It could take any other E 14 light bulb shape for a different look. The great quality lead crystals are of exquisite faceted motif, including a rectangular faceted top portion. There is a total of 40 crystals. They are all hooked to small holes in the folliage and are easily removable. 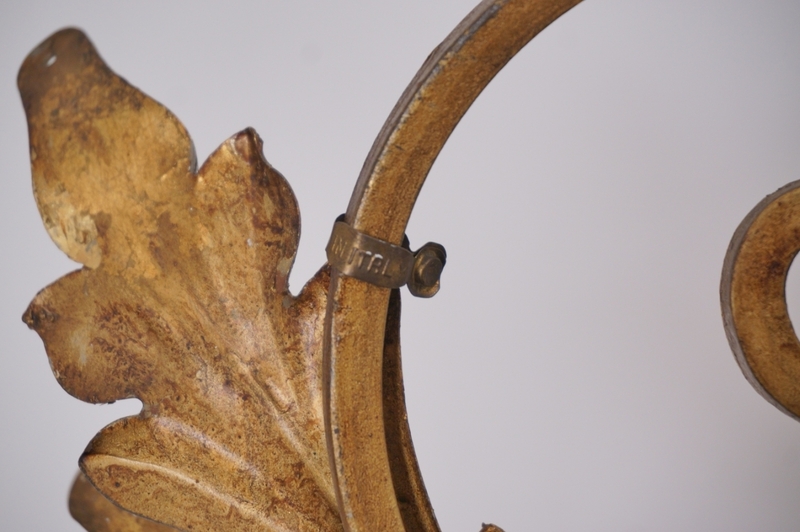 The sconce has the original antique metal tag "made in Italy" in one arm proving the Italian origin. 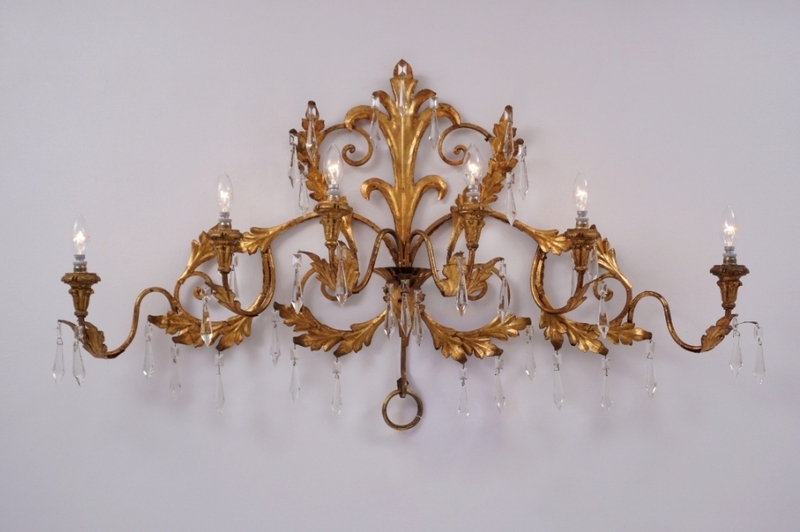 This large sconce is in very good condition. The frame is secure, with the original antique patina present and has an excellent finish, with only tiny loses and marks to the gilt in line with age. The 40 crystals are all present and are the original antique ones, all of them in good condition with no chips and only minor wear in line with age. Packing is offered free of charge. We take special professional care while packing. The crystals will be removed and individually wrapped. The frame would be wrapped in a layer of bubble wrap and soft cardboard. Together these parts would easily fit into a box ideal for posting and shipping. TOLE LIGHTING HISTORY The term tôle, derived from the French tole peinte, "painted sheet metal", is synonymous in English usage with japanning on tin, such as the tôle shades for bouilotte lamps and other candle shades, trays and lidded canisters, in which stenciling and gilding often features, almost always on a black ground.Gilt Tole refers to the decorative application of gold paint on metal, and if it is vintage Italian lighting, they probably were made in and around Florence. A great number of very decorative quality pieces were produced in Italy between the 1940`s & 1960`s. Original European quality pieces always have the metal "made in Italy" tag on them.